Of the five senses, hearing is the one least engaged by food. That might explain why many people don’t listen to food podcasts. Besides keeping us alive, food is one of the great human obsessions – and never more so than in today’s popular culture. Many of us plan our holidays around what we’re going to eat. We love watching food on television, from Anthony Bourdain to The Great British Baking Show. Food is probably about 40 percent of the reason for Instagram’s existence. When it comes to podcasts, though, it seems as if food is just a little too niche for many listeners. It doesn’t help that there’s no “Food” category in Apple’s Podcast app, which accounts for 60 percent of all podcast downloads. Food podcasts are filed under the “Arts” heading alongside shows like Wolverine: The Long Night, The Moth, and a seemingly endless lineup of fictional crime and mystery tales. The end result is that rather than being showcased, food podcasts are buried among Apple’s Arts podcast charts, with only a handful breaking the top 50. That’s a shame, as the genre continues to produce an excellent crop of entertaining shows, with new food and drink podcasts appearing all the time. These typically offer far more breadth of content than the recipe tips and cookery instruction some listeners probably assume comes with the territory. Each episode of The Sporkful begins with its creator and host, Dan Pashman, laying down the show’s mission statement of “obsessing about food to learn more about people.” Pashman is the perfect guide for this journey, taking the listener to unexpected corners of American society simply by asking what people eat and why. Some episodes feature a single interviewee, while others include multiple segments addressing an overarching theme. The Sporkful occasionally features interviews with celebrity chefs and food writers. However, Pashman excels when exploring quirky aspects of food and its place in our culture – a recent episode featured a visit to The Simpsons writers’ room to discuss how food has been depicted on the show over the years. Pashman is also fond of sharing his own offbeat theories on ways listeners can “eat more better,” taking in important questions such as the optimal way to layer toppings on a burger, or all-you-can-eat buffet strategies. He also interviews food personalities with unusual claims to fame – a few episodes back, he met Tom Ryan, who invented the McDonald’s McGriddle and Pizza Hut’s stuffed crust pizza. The tone is generally light-hearted, and with Pashman frequently breaking into uncontrollable, infectious laughter when bantering with guests. However, The Sporkful also knows when to be serious. Pashman brings sensitivity and humility to conversations about food’s relationship to identity, race and culture. In one episode named “Other People’s Holidays,” Pashman (who is Jewish) attends a “Gentile Passover” dinner and reflects honestly and fairly on his conflicted emotions: simultaneously happy that non-Jewish people want to participate in Passover, yet uncomfortable at the rather hollow way the tradition is recreated. Pashman generally tackles these complicated questions thoughtfully and without passing judgment, examining his own perspectives as critically as anyone else’s. The Sporkful is also a very well-produced show. Much of the content is recorded in restaurants and kitchens, and the ambient noise – diners chatting, cooks at work, food being prepped – gives the listener a genuine sense of being with Pashman. Topping it all off is the soundtrack provided by Black Label Music, which usually leans on soulful, funky instrumentals. The Splendid Table started out as a radio show on Minnesota Public Radio, over 20 years ago. Francis Lam, a food writer, book editor and former cook, took over hosting duties at the beginning of 2018 following the retirement of the show’s creator and long-time voice, Lynne Rossetto Kasper. If The Sporkful’s Pashman thrives on irreverence and upending conventional wisdom, Francis Lam’s approach is more earnest. His gentle manner seems to encourage interviewees to open up and share their stories, which makes The Splendid Table as informative a food podcast as there is. It’s also a fun listen, peppered with laughter and entertaining conversation. Averaging around 50 minutes per weekly episode, The Splendid Table tends to run longer than The Sporkful, which typically averages 35-40 minutes each week. Some episodes of The Splendid Table feature a deep dive on a single theme, such as a recent episode covering Filipino food from several angles. 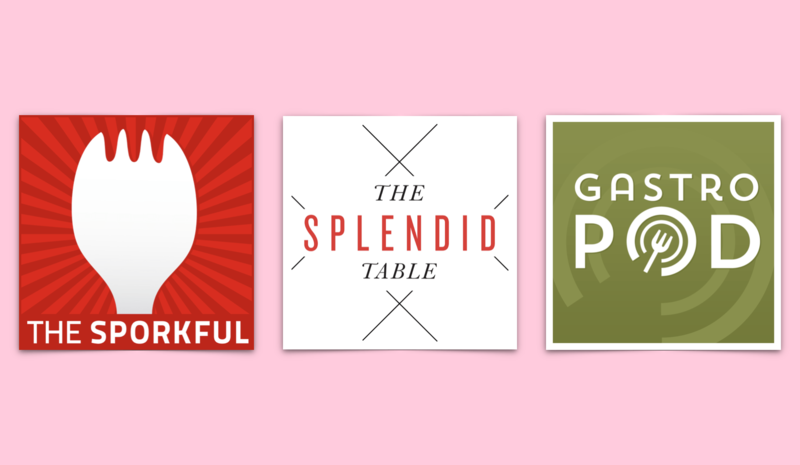 However, the podcast normally takes more of a magazine-style approach than The Sporkful, spotlighting different global cuisines, cooking techniques and food personalities. The Splendid Table’s emphasis is on exploring the world of food and the people who make it, but the podcast also speaks to enthusiastic home cooks. One regular segment features listeners calling in to seek Lam’s advice on how to use certain ingredients or improve a particular cooking technique. The show also checks in routinely with guests from America’s Test Kitchen for insights and cooking tips. As food podcasts go, this is a solid, tried and true formula, and as a host, Francis Lam welcomes even the most hesitant listener into the fascinating world of food. On GastroPod, journalists Nicola Twilley and Cynthia Graber delve deeper than other podcasts into the science and history behind the way we eat. A typical episode spotlights a topic from the world of food and drink, with recent episodes covering mangoes, military rations and preservatives. Twilley and Graber reach back in time to uncover their subject’s origin stories, adding layer upon layer of geographical, cultural, scientific and historical detail to tell the story right up to the present day. As a consequence, GastroPod tends to be more global in perspective than The Sporkful and The Splendid Table, regularly featuring voices from all corners of the world. The richness of content may explain the two-week cycles between each 50-minute edition of GastroPod, in comparison to the weekly schedules followed by The Sporkful and The Splendid Table. Twilley and Graber are strong storytellers, weaving cohesive narratives from complex material and explaining the science with clarity.